Ever since I started getting into fitness as a graduate living and working in London, I’ve trained outside. My first fitness love was British Military Fitness. I’d go to one of London’s parks and train before or after work. In the mud, wind, rain, snow and sometimes sunshine. I loved the camaraderie of training with other people. Doing burpees, piggy backs, sprints and whatever other creative exercises the instructors would come up with. It was super tough training but also fun and felt as though every session taught me how to dig a little bit deeper. My first challenge was an adventure race in the jungle of Borneo. Next up, I did an Olympic distance triathlon, followed by cycling London to Paris in 24 hours and then climbing Mont Blanc. These were all still in the early days! These challenges sparked my passion for being outdoors and it’s something that’s stuck with me ever since. In recent years, I cycled through the Alps and climbed the highest mountain in each country. I’ve finished Ironman Wales twice, run 100km ultra-marathons and raced my bike across the USA from LA to Miami. No matter the weather I prefer to train outside. Training in an uncontrolled environment prepares me mentally and physically to be ready for anything. Exactly what I need when I’m half way up a mountain and the weather closes in. My training schedule involves running, strength training, swimming and cycling. All of these provide happiness and opportunity to build fitness, yet they are completely free. I have a 16kg kettlebell which I swing in my garden doing 500 reps per workout. I wake up and work out, listening to Tim Ferris podcasts. I highly recommend this as a way to stretch the body and mind at the same time! Whether you live in the city or the the countryside, the beautiful things we get to see when we train outside are amazing. The world changing as we move between seasons, the grey days and the days when the sky is blue and bright. They’re are all part of it. I’m a sucker for sunrises so this is always a great motivation for me. When I make the effort to get up and train at sunrise, I feel like I’ve created something for myself that’s 100% free and reminds me it’s often the smallest things that can have the biggest impact. All it took was a little extra effort from me and in return, set my day up in the best possible way. I’m lucky that I have friends who share the same passions as me. 80% of my friends are up for some form of fitness which means it’s always my first port of call when arranging to meet them. 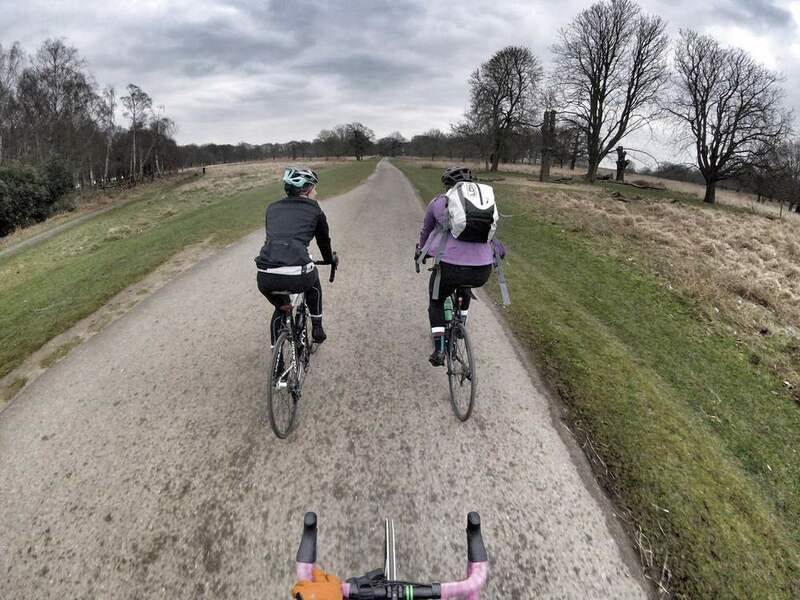 In the last few weeks, I ran 20km along the Thames with my friend Annie, cycled 50km and found a lovely brunch café with a group of ladies I cycle with, spent the weekend cycling the country lanes in Oxfordshire, and joined the London Midnight Runners for a 30km run in London. The final reason I love training outside is that it’s my way of creating stillness and headspace in my life. Breathing the cold air into my lungs whilst pounding the ground at my feet or spinning the wheels on my bike, I breathe and smile, knowing this is an investment in my mind as much as my body. All I need is the equipment I already own, a creative approach to planning training adventures, a willing partner and the motivation to get up and go. To keep up to date with my training and weekend adventures, join me on Instagram, Facebook or Twitter! Say hi and let me know what kind of training works for you.